Patyegarang, Bangarra Dance Theatre. Drama Theatre, Sydney Opera House, June 12. THE story of young indigenous woman Patyegarang and Lieutenant William Dawes of the First Fleet is rare and precious. In the tumultuous first years of white settlement, as the British colonisers imposed themselves and their culture on what is now the glittering city of Sydney but was then the Eora nation, Dawes studied and recorded the local language. Patyegarang appears to have been his most important teacher. Bangarra Dance Theatre’s long-serving artistic director Stephen Page has chosen to mark the company’s 25th anniversary with this touching connection between black and white – a meeting of minds that took place just a short stroll away from the theatre in which Patyegarang received its premiere. And perhaps it was a meeting of bodies too. That is the strongest impression gained from Page’s rendering of Patyegarang’s relationship with Dawes, perhaps inevitably so. The wordless physical language of dance finds it easier to imply intimacy of the flesh than of the intellect. Page takes a non-literal, dreamlike approach to this sliver of history. In 13 brief scenes he touches on life before dispossession, its rituals and its spiritual breadth. After colonisation comes conflict and resistance, although these elements share the misty quality that veils the piece as a whole. As one scene melts into another it become evident that narrative has a very small part to play. Patyegarang is a highly impressionistic, meditative work. 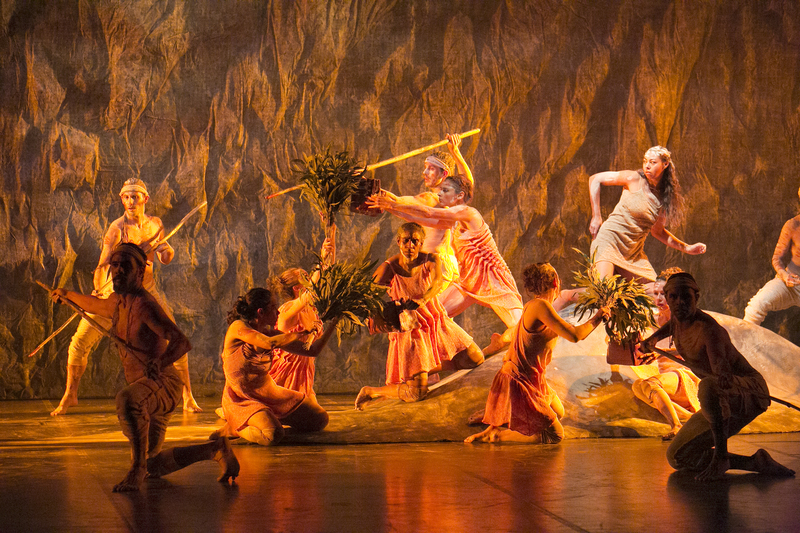 As always with Bangarra, the staging of Patyegarang is outstandingly beautiful, so much so that it may be enjoyed as a work of visual art (Jacob Nash, set; Nick Schlieper, lighting; Jennifer Irwin, costumes). The evocation of a pristine land and the play of light on rock are magical, adding to the atmosphere of otherworldliness. All this means Patyegarang is stronger on mood than specifics. It’s like a string of pearls, perhaps too loosely strung. The soft lustre is appealing but greater tension and more varied emphases, particularly in composer David Page’s rhythmic structure, would make a more powerful impression. There are no reservations about the performances, chief among them Jasmin Sheppard’s luminous, enigmatic Patyegarang. She is the glowing centre of the work. Much of the movement for Thomas Greenfield’s Dawes aligns him with the indigenous men and leaves him looking a little unrealised as someone from another world, but Greenfield is an imposing man who makes the most of what he has. The other standout is Elma Kris, Bangarra’s senior dancer and a performer of quiet but radiant charisma. While Patyegarang as a whole is a touch diffuse there are many individual moments as striking as any in Bangarra’s formidable history. A section titled Night Sky takes place under a canopy of lights, alluding to Dawes’s knowledge of astronomy and perhaps to the Seven Sisters, a group of stars that features in Indigenous legend. And nothing is more affecting or effective than the image of a young woman mourning the departure of her friend, her head covered with his red coat as if prefiguring a Magritte painting. In the last moments we hear the word Eora repeated and see a tableau that suggests permanance. There are only three people on stage and the language is soft to the point of fading, but they are there. Page calls this scene Resilience. The meetings between Patyegarang and Dawes apparently lasted only a few months. Certainly Dawes was not long in the colony. He didn’t want to leave, by the way. He wanted to settle in Sydney but was denied permission and left in 1791. Just three years later he was commended by none other than anti-slavery campaigner William Wilberforce for his commitment to that cause. Of Patyegarang there seems to be no other trace. Patyegarang runs in Sydney until July 5. Then Canberra, July 17-19; Perth, July 30-August 2; Brisbane, August 15-23; Melbourne, August 28-September 6. A version of this review appeared in The Australian on June 16.